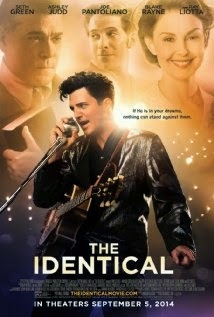 My husband and I were able to see a great movie called The Identical before it was released to the public. The movie theater has a special showing for church leaders and bloggers. My husband and I are both active leaders in our church so we jumped at the opportunity to see a faith based movie. The movie The Identical was a great movie that I recommend seeing. This movie shows people how God interacts in our lives and directs our paths. This inspiring movie tells of a boy who follows his dreams, against his preacher dad's wishes, to become a singer. During his journey he discovers a different path God had for him. The music in the movie will remind you of Elvis, although I don't know if that was the producers intention. The Identical is coming to theaters September 5th and this is a movie that is great for the whole family to see. I will be bringing friends with me when I watch the movie again. This is a movie you will want to see. The IDENTICAL tells the compelling story of twin brothers unknowingly separated at birth during the Great Depression. DREXEL HEMSLEY becomes an iconic 50’s rock ’n’ roll star, while RYAN WADE (Blake Rayne) struggles to balance his love for music and pleasing his father. The Reverend Wade (Ray Liotta) and his wife (Ashley Judd) are sure their adopted son has been gifted and called by God to be a preacher. But Ryan challenges his parent’s vision for his life, and unflinchingly chooses to launch his own music career with his best friend (Seth Green). Encouraged by his wife (Erin Cottrell) and employer (Joe Pantoliano), Ryan embarks on an unpredictable, provocative path - performing the legendary music of Drecel Hemsley in sold out venues all across the country. As the brothers destinies tragically collide, Ryan discovers that Drexel is his identical twin which leads him to question everything he’s ever believed about God, family, and his own identity. The movie also has great music in it and I was sent THE IDENTICAL ORIGINAL MOTION PICTURE SOUNDTRACK SAMPLER to enjoy. I listened to the CD and it brought back great memories of the movie. I even sang along with the music as I did my work. The music was very much in the style of Elvis as the lead actor looked and sounded very much like him. THE IDENTICAL ORIGINAL MOTION PICTURE SOUNDTRACK SAMPLER features 12 of the 20 original songs by Jerry Marcellino and Yochanan Marcellino from the film. Including “Your Love’s Keepin’ Me Tonight,” “City Lights,” “Angel of Mine,” “Everybody Knows It” and “Nashville Tonight." I have a copy of this awesome THE IDENTICAL ORIGINAL MOTION PICTURE SOUNDTRACK SAMPLER to giveaway to one of my readers. Just enter on the Rafflecopter form below and good luck! "These opinions are my own. I received a copy of the above mentioned soundtrack in exchange for a review on my blog." This sounds like a great movie! Never heard of it before now but something we would watch. First time hearing about this movie, but I like Ashley Judd as an actress. From the cover of the soundtrack, I do think they meant to sound similar to Elvis. Very neat idea for a movie. Haven't heard of it before now - thanks for sharing! I have to say that I love the cast & story line. I can't wait to see this! I'm looking forward to hear that soundtrack! Sounds like the music will be awesome! You are so lucky to have gotten a chance to see it! I'm going to suggest this movie for our date night...wish me luck because the hubs only likes movies where things are blowing up :).